A Boston Food Diary: Geoff & Drews, Gourmet Cookies and Brownies- Perfect for the holidays! Geoff & Drews, Gourmet Cookies and Brownies- Perfect for the holidays! Cooookies... They are everywhere right now. Everywhere I look there seems to be a plate of cookies just waiting to be devoured- it must be the holidays huh? Given this delicious state of affairs lately, I was thrilled to accept an invitation to a cookie info and tasting session that was held last night at the Harvard Square Clover. The event featured the cookies and brownies of Geoff & Drew's, a locally based cookie gift company started in 2001. Of course, high end cookie gifts wasn't the way that Geoff & Drew's began. Started by four friends, their original idea was to delicious fresh warm cookies and milk to area college students needing a break from their studies. Unfortunately, the logistics of this idea didn't work out as well for them, however they knew they had a good thing going with their cookies. And so- the gift cookie business for Geoff & Drew's was born. Today, they offer at least four different types of cookies including chocolate chunk, double fudge, oatmeal with cranberries, and white chocolate cranberry. Each flavor has a delicate flavor obviously showcasing the quality real ingredients used. Every bite tastes fully of butter and sugar and all of those wonderful ingredients that make up a delightful cookie. However they don't stop there- Geoff & Drew's also makes a killer brownie! I indulged in a piece of a toffee brownie last night- and it was absolutely amazing. Honestly- I don't think I can say too much more about it other than that they are outrageously delicious! Geoff & Drew's has a great selection of Gingerbread Men and all of their gift boxes are artfully presented thereby making great gifts. I can see these going over well with teachers, babysitters, coaches, etc. 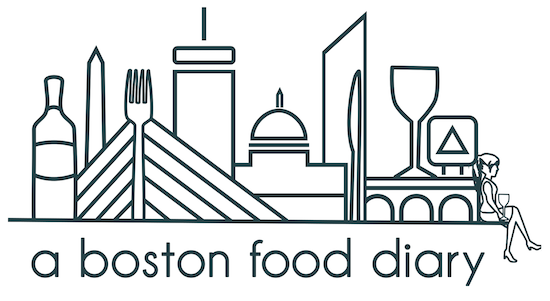 AND just to "sweeten" the pot a bit, Geoff & Drew's has extended a 20% discount for you fantastic A Boston Food Diary readers! When placing your order use discount code "Blog20" to receive a discount on your order (sales items not included). Too bad I wasn't able to attend this event, I would've loved to meet you and other bloggers! I've never actually heard of Geoff and Drew's before until recently, and it seems like everyone raves about their cookies so now I want to try 'em myself! Great recap! Last night was so fun! Looks like so much fun! How did you get invited to this?! Nice recap... these cookies were fabulous! I still have a brownie waiting to be devoured in my office. YES.